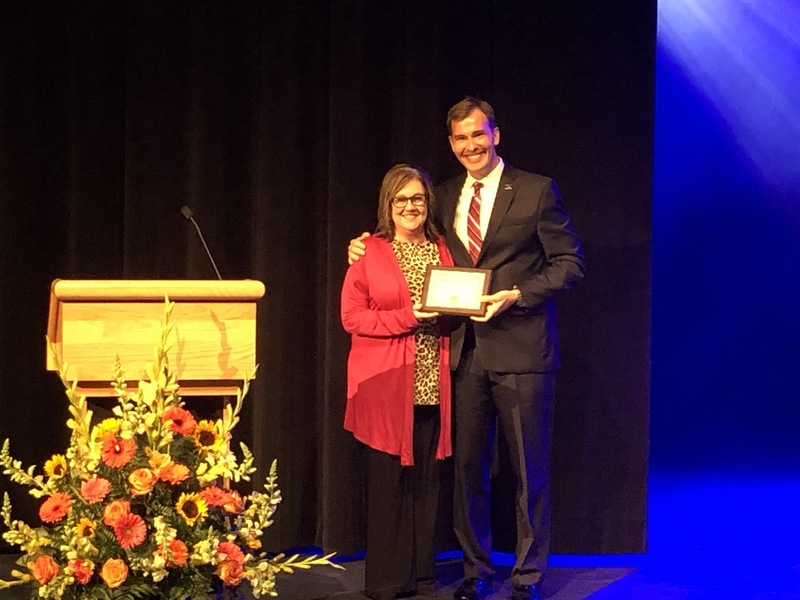 HOPE – Clinton Primary School Assistant Principal (K-1) Robin Townsend was recognized April 6 as the 2019 Hope/Hempstead County Chamber of Commerce “Educator of the Year” in ceremonies at Hempstead Hall on the University of Arkansas-Hope campus. UAHT Chancellor Chris Thomason, the 2018 Educator of the Year honoree, introduced Townsend before a sell-out crowd in the UAHT main theater. Townsend moved from Beryl Henry Elementary School in 2016, where she served as an instructional facilitator for four years. Prior to that time, Townsend served as an instructional facilitator at Clinton Primary from 2003-2012, and was the Parental Involvement Facilitator for the campus during that period, as well. She began her career at CPS as a fourth-grade teacher in 1992. Townsend is a 1990 graduate of East Texas State University in Texarkana, with a BSE in Elementary Education. She received her ESL certification from Henderson State University in Arkadelphia in 1996, and took her Masters degree in Elementary Education from Southern Arkansas University in Magnolia in 1998. Townsend completed a Masters degree in Educational Administration P-8 at Texas A&M University in Texarkana in 2009. She is active in professional and local organizations as a Great Expectations of Arkansas Professional Development Facilitator for six years; former President, National Association of Junior Auxiliaries, Inc., and former President, Junior Auxiliary of Hope; and member of Delta Kappa Gamma. Townsend is also a former Hope Rotary Club Teacher of the Year. She is the wife of Ron Townsend, and mother of three daughters, all of whom are professional educators, including Monica Morris, Teacher Center coordinator for Southwest Arkansas Educational Cooperative; Mandy Townsend, Hope Academy of Public Service teacher; and Casey Schoenberger, media specialist, Clinton Primary School. Townsend is also a member of the First Baptist Church of Hope, where she has taught preschool level Sunday School for 20 years.